I’m always intrigued by the inviting perches found on Maldives resorts for sitting and chilling in the warm ocean breezes. The most classic is the ‘hammock’ which has even found its way out to the middle of the lagoon. Swings off more elaborate styles and designs are a regular feature. I was particular taken by the stylish ‘birds nest’ seats on Lily Beach. Dangling from a single line, gives is a 360 degree motion (versus conventional swings and hammocks that a limited to side-to-side action). 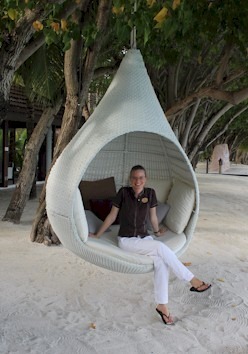 Crammed with soft pillows, the seat swing was a place I could definitely spend hours on end. The ‘bird’ modelling here is the gracious sales manager Agata Sobczak who welcomed me on our visit.